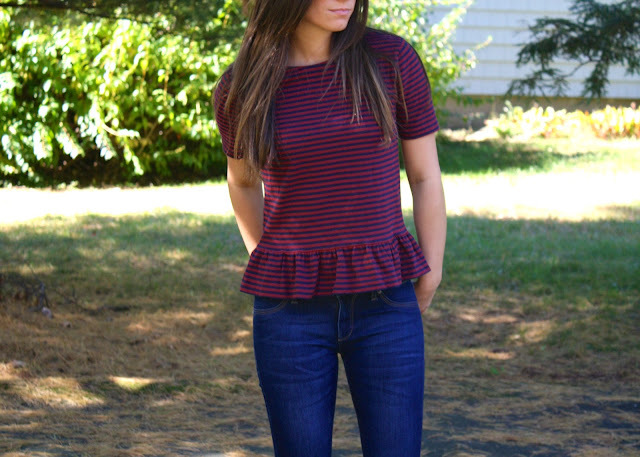 A classic navy blue and maroon t-shirt gets an instant update with peplum trimmings. I later made a trip to J.Crew and found a fantastic peplum cardigan, stay tuned! Nice photos and really cool outfit, you look great, I like your jeans, what a great color and that top is so nice, the perfect touch to the outfit also you are really beautiful and your boots rock! Your have a lovely blog by the way and I am a new follower on GFC and Bloglovin! Hope you will like my blog and follow back!